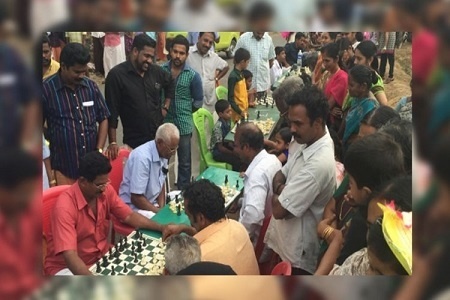 Chess Maaman Unnikrishnan from Kerala is now on a Mission to eradicate Alcoholic Addiction. The idea of teaching the game of Chess cropped up quite accidentally. Sowing the Chess game seed in every Man in the village has certainly borne fruit. Alcoholic Anonyms centres are struggling really hard to come up with creative and innovative ways to help the addicts, BUT this one has surely check-mated. 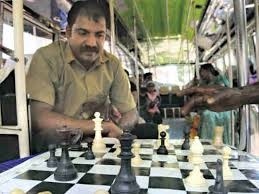 Unthinkable Chess therapy for Alcoholics and the flourishing illicit liquor brewing businessmen in the 60s and 70s was adopted by the Men initially and soon this craze followed suit even with women and children. He is fondly known as Maaman – Uncle in Malayalam and is simply adored and respected by everyone. The villagers are not against drinking but ever since they learned the game and play regularly, the drinking habits are strictly under control. 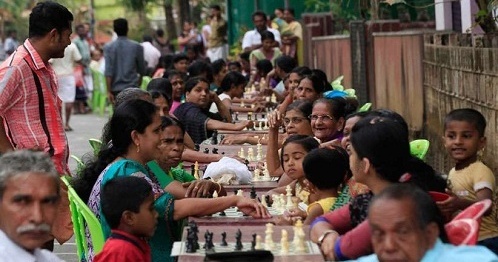 They even have a Chess Association with Mr. Baby John as the President and regular tournaments are conducted. 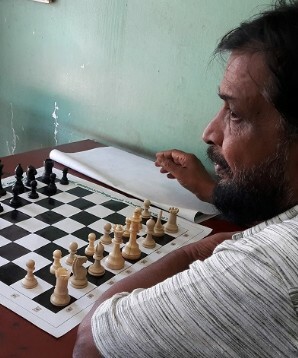 It is the first Chess Literate village in India. 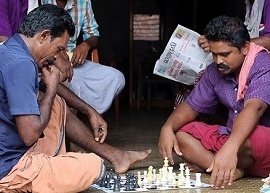 Chess is the buzzword in this village. All through the week it's a pleasant sight to see everyone including women and children play Chess whenever they feel like whether it is night or day. One is in for a special treat on a Sunday at their home, where people start pouring in, in the wee hours of the morning, grab a place, play with anyone and this goes on and on says an ever-smiling Maaman’s wife. 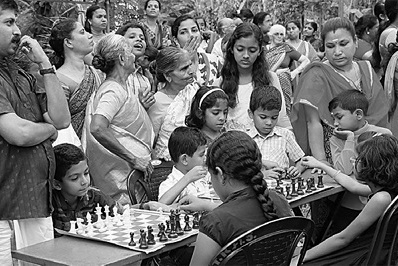 The tree-lined streets are also crowded with chess matches happening and enough number watching. Even the drivers and conductors sometimes stop and play a game or intently watch. After toiling all day long at the Rubber plantations, the men would invariably get drunk and create havoc and gradually ruining every household. Maaman who owns a tea shop observed this trend for years where women and children were subjected to violence. This perennial problem plagued him constantly but he also knew that he alone would not be able to curtail this practise no matter what the solution was. The best way out was to form a group “Madhya Nirodhana Samiti” to eradicate this menace. Most of them were women members who secretly informed about the men who indulged in the business. Maaman, in turn, would report immediately to the Excise Officials. Nothing strange or new that the officials kept him waiting for hours on end to arrive. While waiting, he picked up the Board and started teaching to a few tired and exhausted men who returned from their Rubber plantation duties. This was the turning point in the lives of the addicts and the men who indulged in the business and the helpless women and children. The game provided them with a new High and a Kick of a different sort. Men are aware that it needed a high level of concentration, patience, skill and obviously cannot be played while one has consumed excess liquor. Maaman proudly asserts – Its a healthy addiction and see the positive change it has brought about in the homes and the village. It has become a favourite hobby, pass-time with everyone whether young or old. It has brought so much joy and laughter in every household. It is a game one can play anytime whether rain or sunshine, the Board can be easily carried around if required, the moves or rules never change and its simple to understand, just two willing people can sit around anywhere, it doesn’t require any fancy playgrounds, its like a real fight on the Board. Maaman says - “Protecting the King which is like protecting the head of the family” and everyone seems to relate to their daily lives where they are fighting against addiction to safeguard their Man of the family. It's like combating problems in our daily lives. Is it the Best Therapy ? The Association would be more than happy to extend it to other villages but it may or may not work for everyone but there is no harm in giving it a try. While Maaman continues his good work, hope he gets some recognition and much deserved awards.